The first time I heard someone mention adopted children and special needs in the same sentence was during a meeting with ten professionals. The psychologist speaking was not referring to the adopted children who are classified as special needs because of a cleft palate or a heart condition, she was alluding to any child that is adopted. Labeling has been used to the detriment of countless children, yet when I heard this, my mind was put at ease. It was the same as when I found out my son was Autistic. Both diagnosis gave me an answer, something I could look into, something to lean on when I needed to know where to go. In the instance of special needs in association with adoption, it only gave me a peace of mind. I knew there were issues with my daughter, she’d already been diagnosed with multiple disorders (they are not a crutch for us, but a building block, and a way to understand what she’s dealing with), but now I also found contentment in knowing that the medical community was recognizing our children’s pain. When practitioners get behind something, we know that there is more acceptance in society. This information confirmed how I had felt about adoption since bringing our daughter home. Adopted children cannot be raised as biological children, they require altered parenting techniques. Essentially, many of them have special needs, they /need/ special parenting to help them heal from their past trauma and neglect. I do believe there’s a minimal number of adopted children who do not have special needs. Whether that be because they didn’t feel a separation from their mother at birth, or their adoptive parents innately knew what to do to help them deal with their feelings surrounding their adoption. This whole concept of adopted children having special needs is something that’s overlooked in the adoption community. Adoptive parents (especially ones who adopt infants domestically) want to imagine that their child will do well and won’t suffer or have any repercussions from their early separation, or from being unwanted in the womb. This is a world that needs to be placed under the microscope, if only to help those children and adults who need it, not to create something that doesn’t exist. 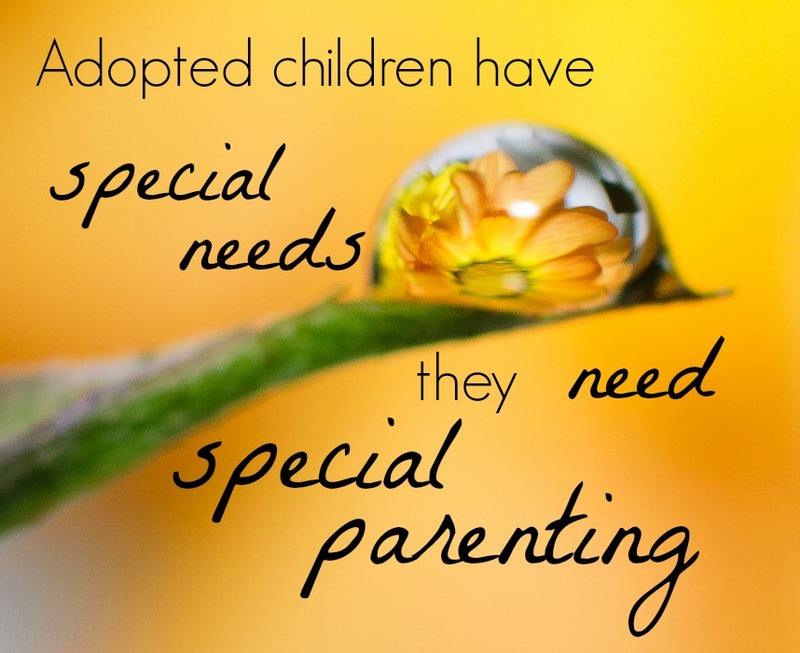 Have you heard about adopted children in general having special needs? What do you think? This entry was posted in Uncategorized and tagged adoption, infant adoption, neglect, special needs, trauma. Bookmark the permalink. Thank you! That’s exactly how I look at it, I feel that without understanding and compassion, we cannot help our hurting children in the way the truly need us to.